description - The dimensions given are completely wrong as I have a spec that we require the structure to meet which I have attached. An indicative price is urgently required. I will need details of warranty and option for delivery to SVG and your own installation cost. 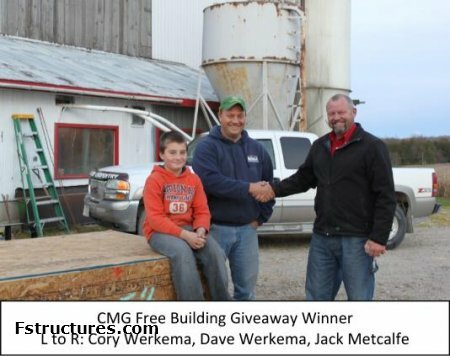 Dave Werkema, of North Huron Carpentry Services, is the grand prize winner of CMG Building Solutions’ FREE building giveaway – a 12’ x 20’ fabric covered building with 2 ends. Located near Blyth, Werkema and his crew specialize in additions, renovations, general repairs and new homes. Werkema entered the draw at the Huron County Contractor’s Expo held on March 25, 2011 in Goderich. To celebrate their first year in business, CMG wanted to do a giveaway that would show their customer appreciation, highlight their products and services and get people talking. Throughout the course of the year, CMG attended various tradeshows across the province and had the ballot box for the draw at each show. People could also enter the draw on line, or by simply calling the office. Werkema’s name was drawn from over 500 entries.